The University of Maine has released a new gourmet potato variety, Pinto Gold. The potato was tested with the research identification number AF4659-12 and has been available in seed catalogs under that name since 2015. The potato is a high-yielding, yellow-fleshed specialty variety with excellent roasting and eating quality, according to Gregory Porter, who leads UMaine’s potato breeding program. The oblong tubers have a red and yellow “pinto type” skin pattern, which makes them appealing to smaller specialty markets. The Pinto Gold variety name highlights the unique skin color pattern and the tubers’ yellow flesh. The potatoes, which can be described as creamy or waxy, are excellent roasted, but can also be used for boiling, pan frying, baking and in salads, says Porter, a professor of plant, soil, and environmental sciences, as well as agronomy. Smaller tubers can be harvested around 100 to 110 days after planting, however, they need a longer growing season to produce tubers that are large enough for baking, Porter says. The variety is adapted to cool, northern growing areas and produces a high yield of small tubers under those conditions. It has shown good to moderate bruise resistance, and hollow heart problems have not been observed. Under Maine conditions, most tubers will have good shape, but there will be some bent or pointed tubers. Prevalence of these off-shapes becomes a severe problem in hotter growing areas to the south of New England, according to Porter. The potato resulted from an initial cross between A99331-2RY and US147-96RY by the USDA-ARS potato breeding program in Aberdeen, Idaho in 2006. Unselected plant material from the USDA cross was sent to UMaine in 2008. The plant material was grown in the field at UMaine’s Aroostook Research Farm in Presque Isle and AF4649-12, subsequently named Pinto Gold, was selected from the plant material in October 2008. AF4659-12 continued to show promise in research trials conducted in Maine from 2009 to the present. Beginning in 2012, seed samples were sent to organic growers for small-scale production and marketing trials. 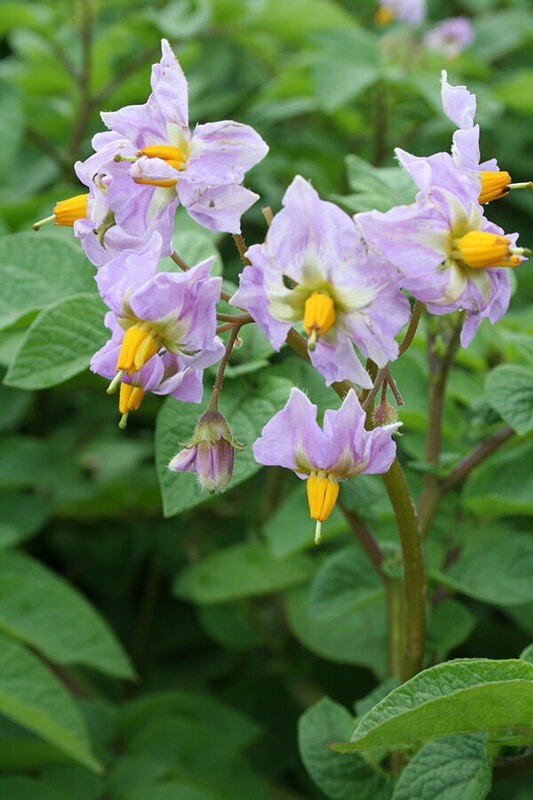 Pinto Gold is the fourth potato variety released by UMaine since 2014. The university, in partnership with the Maine Potato Board, previously released Easton, Sebec and Caribou Russet. Although Pinto Gold will likely never be produced on thousands of acres in the state, Porter says, he believes it will be beneficial for small-scale growers, restaurants, home cooks and gardeners. “They’re pretty, unique and the tastiest roasting potatoes you could ever have,” he says.